Aisle Say - Stage reviews and opinion. American Drama - A venue for new writings in American drama. American Theatre Magazine - Stay current with the regional theatre scene in nearly every U.S. state. Applause Southwest - A digital exploration of theatre past and present in Plymouth and the surrounding area (Southwest England). Arts International : (ai) magazine - Your passport to the world of new performance. Crosses disciplines and geographic borders in search of new aesthetics and hybrid forms, while taking you inside the work of innovative performers and producers. Ashley West - Theater critic for Oakland Examiner. Asian Theatre Journal - Dedicated to the performing arts of Asia, focusing upon both traditional and modern theatrical forms. Backstage - Online performing arts resource: news, casting, features, showguide. British Theatre Guide - British theatre, news, actors, plays. Broadway - Schedules, performance reviews. Broadway Critic, The - What's happening in the San Francisco Bay Area theatre scene, as well as on Broadway & London, featuring reviews, commentary, news, audition notices and other theatre information. Broadway Stars - Filled with daily theater news. Some stories are culled from obscure regional alternative publications. The site also contains links to various discussion boards. Chloe Veltman's Theater Blog - Chloe Veltman is the Bay Area culture correspondent for The New York Times. Her weekly column about the Bay Area arts scene for the Times appears in the paper every Sunday. Comparative Drama - Scholarly journal. Counterpulse Blog - Located in SOMA in San Francisco, CounterPULSE is a non-profit theater, performance space, community center, and gallery with roots deep in the Bay Area's provocative performance and dance scenes. CounterPULSE produces its own shows, helps support local artists and activists with its programs and can be rented for productions and rehearsals. Culture Wars (UK) - Reviews of books, plays, films, and contemporary ideas, with emphasis on fringe theater. Curtain Up - Theater reviews, features, and annotated listings. Didaskalia: Ancient Theater Today - An electronic resource and journal dedicated to the study of ancient Greek and Roman drama and its reception. Drama - Drama educators and practitioners share theory and practice, debate issues, publish research, engage in critical analysis, and express personal opinion. High Performance - Socially and culturally adventurous art. HowlRound - The journal of the Center for the Theater Commons at Emerson College. Insight for Playwrights - A monthly marketing newsletter with the latest submission information for theatres, playwriting contests, workshops, residencies, and other development programs for dramatic writers. Irish Theatre Magazine - A quarterly magazine devoted to theatre in Ireland and Irish theatre around the world. Each issue contains features, reviews, commentary, columns, and news about productions, companies, individuals, venues, and festivals. Journal of Theatre and Drama (JTD) - Published annually by Haifa University Press. Karen D'Souza's Theater Blog - San Francisco Bay Area theater critic for Mercury News. La Jolla Playhouse - Founded in 1947 by Gregory Peck, Dorothy McGuire and Mel Ferrer, and was revived in 1983 under the leadership of Des McAnuff, who served as Artistic Director from 1983 to 1994. From Broadway to Moscow, a long list of Playhouse productions have gone on to other stages around the world. Live Design - Covers the latest news, tools, and technology that fuel innovation across live entertainment, corporate events, Broadway, houses of worship, clubs, and more. 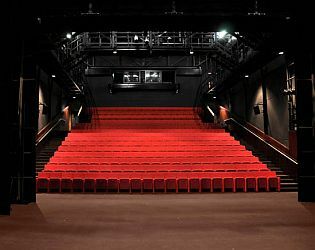 Long Wharf Theatre - New Haven, Connecticut. New York Theatre Experience (nytheatre.com) - Guide to New York theatre scene. New York Theatre Wire - Multi arts coverage that includes Broadway, Off and Off off Broadway, Experimental Theater, Dance, Film, Opera and International Festivals. New York Times: Theater - Theater reviews and hhighlights. NYTheater - New York City theatre info, lists, and reviews. Off Broadway League: Blog - Covers Off-Broadway shows and events. Performink Online - Provides a wide range of news and information for professionals in the Chicago theatre industry. Theatre news, theatre business and Chicago industry personalities are just a few of the areas covered in each issue. Subjects affecting the careers of not only Chicago performers, but also directors, producers, designers, filmmakers and dancers are always in focus. Performance Paradigm - An interdisciplinary, refereed journal that reflects contemporary performance research across a range of cultures and contexts primarily in Asia and Australia. Performing Arts Journal (PAJ) - Extended coverage of the visual arts (such as video, installations, photography, and multimedia performance), in addition to reviews of new works in theatre, dance, film, and opera. Play by Play - Student theatre newsletter. Plays Magazine - Drama magazine for young people. Pollstar Magazine - Provides music business professionals with the most reliable and accurate source of worldwide concert tour schedules, ticket sales results, music industry contact directories, trade news and unique specialized data services. In addition to publishing the concert industry's leading trade publication, Pollstar also maintains the world's largest database of international concert tour information. Projection, Lights & Staging News - News, events, products, companies, reviews and resources. SF Bay Discounts - San Francisco Bay Area discounts, coupons, special offers and ½ price theater, concert and event tickets and news. Shakespeare Magazine - A magazine for teachers and enthusiasts. SHNews - SHN (Shorenstein Hays Nederlander) presents the Best of Broadway theater series, and own and operate the Curran, the Golden Gate, and Orpheum theatres in San Francisco. Show Business - Weekly trade paper for New York City's performing arts industry. Since 1941, Show Business has been committed to providing the best and most comprehensive trade resources and information available to help guide actors, singers and dancers toward success in their performing arts careers. Provides direct access to all the important audition and casting notices. Its Cityshoot section is the most comprehensive listing of independent and studio films in development and production in New York. It's a great resource to finding out who's filming what, and when. Stage, The (UK) - News and services for the UK entertainment and performing arts industry. Stage Directions Magazine - Sound, lighting, costumes, administration, directing, designing. Stanford Drama - Produces a full season of theatre during the Stanford University academic year, in a variety of performance spaces. Talkin' Broadway - News, interactive discussion, and information about Broadway, and the current theatre scene in San Francisco, Las Vegas, Toronto, and other cities across the United States. TDR - Covers performance in everyday life, rituals, media, dance, theatre, performance art, popular entertainments, and sports--emphasizing the experimental, the anthropological, the intercultural, and the inter-disciplinary. Theater - Yale School of Drama/Yale Repertory Theatre magazine. Practical, creative, scholarly. Theatre Journal - Social and historical studies, production reviews, and theoretical inquiries analyzing dramatic texts and production. Theatre Research International - Articles on theatre practices in their social, cultural, and historical contexts, their relationship to other media of representation, and to other fields of inquiry. Theatre Survey - Theatre history journal. Theatre Topics - Focuses on performance studies, dramturgy, and theatre pedagogy. Variety - Entertainment news, movie reviews, awards, festivals, celebrity photos, industry news and events. Western European Stages - Each issue contains a wealth of information about recent European festivals and productions, including reviews, interviews, and reports. Winter issues focus on the theatre in individual countries or on special themes. News of forthcoming events: the latest in changes in artistic directorships, new plays and playwrights, outstanding performances, and directorial interpretations. Women & Performance: a journal of feminist theory - A bi-annual publication featuring essays, scripts, interviews and articles on performance from interdisciplinary feminist perspectives. Encourages dialogue between varied fields of performance scholarship (ethnography, dance and theatre history & criticism, performance studies, cinema studies, cultural studies), and explores emerging feminist critiques of race, ethnicity, class, sexuality, technology and nation. Working Actor, The - A blog.